A variant cover painted for issue #1 of the 12 issue limited series, Dead Man Logan, published by Marvel comics. Logan knows he’s dying, and he knows he’s only got so much time to take care of his unfinished business. If you’re familiar with the original Old Man Logan story and the Secret Wars timeline, you’ll be familiar with the fact that Old Man Logan HATES Mysterio. This story is Logan’s final effort to seek revenge on a short list of villains with a long list of enemies standing in his way. 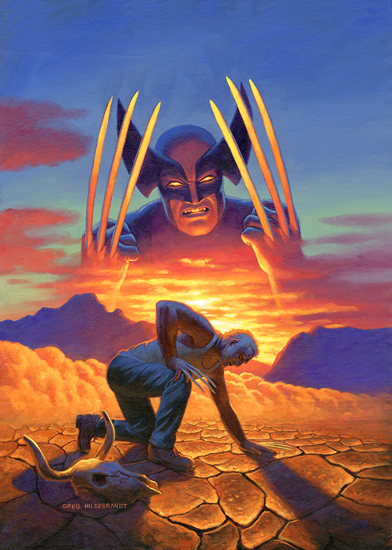 When Greg painted this cover, he aimed to capture the wild, fighting spirit of the Wolverine Logan once was, hovering as a distant ghost while Logan struggles to get back on his feet. Is he in his own timeline or someone else’s? A memory, or a possible vision of the future? This painting is a stark contrast to the bloody, dark, depictions being released on the main cover for this book. It is bright, colorful, but still emotionally charged. The struggle, the energy, the weight that has always been heavy on Wolverine’s shoulders…all of it is here in this image. And so is his determination and his unbreakable will.